C-Man and I decided to host the second annual Princemas party with Prince music, Prince-themed food, guests dressed in purple, and Prince decorations. 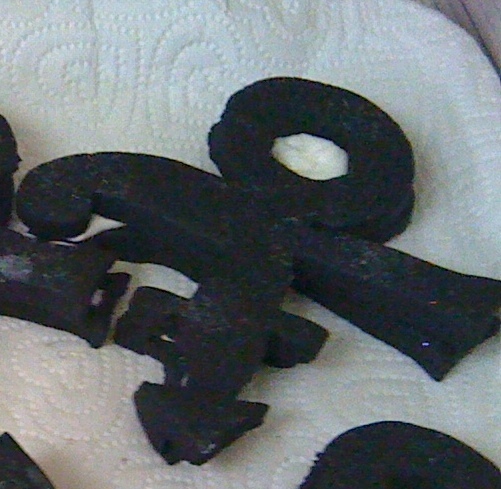 For my Prince-themed food contribution, I thought I would make Prince symbol cookies. I had taken a cookie class at All In One Bakery and felt inspired. However, in class, the dough was premade and we just cut out and decorated the cookies. I naively thought I could easily make cookies from scratch even though I’ve never done it before. 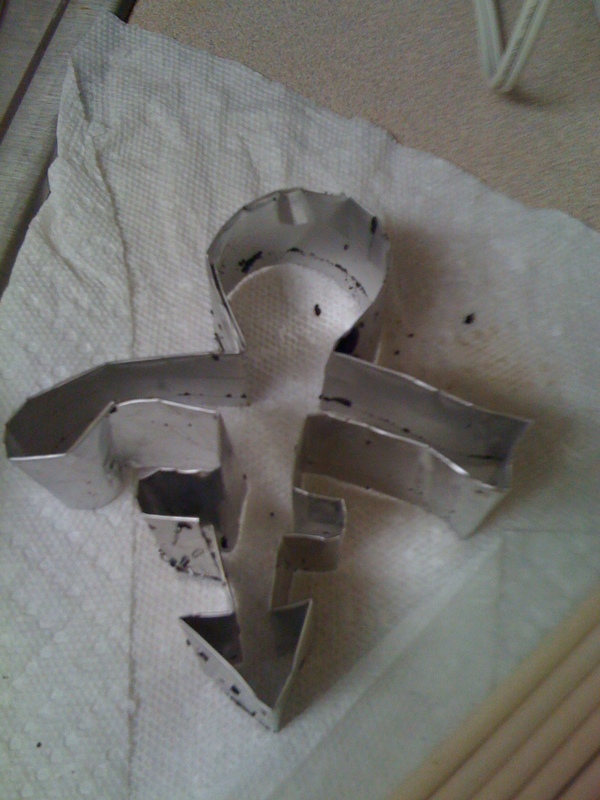 First, I made the Prince symbol cookie cutter using these instructions. It recommends using only one strip of foil per cookie cutter, but I stapled one strip to the end of another strip and it still worked. Be very careful with the sharp edges. I got a foil splinter from making this. Next, I started making the dough. AIO directions: Cream butter and sugar. Add eggs and vanilla and mix until smooth. Add cocoa and mix. Combine flour,baking powder, baking soda and salt and add to mixture. Mix just until well incorporated – but you don’tsee any white flour. Don’t over mix. 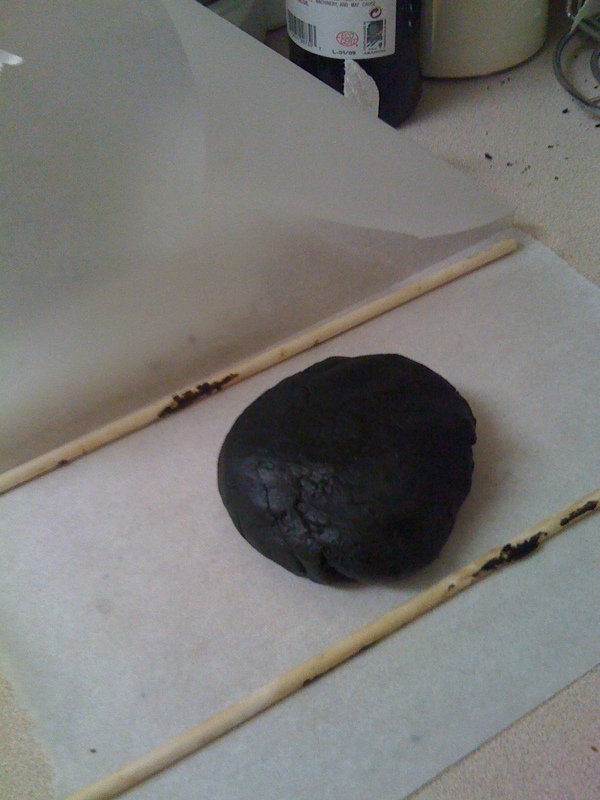 Roll out dough to 1/4 inch thickness between two pieces of parchment paper. I used wooden dowel sticks as my thickness guide. Refrigerate flattened dough for 1 hour. During the hour the first batch was in the refrigerator, I started a second batch. Preheat oven to 350°. Peel parchment off of top side. 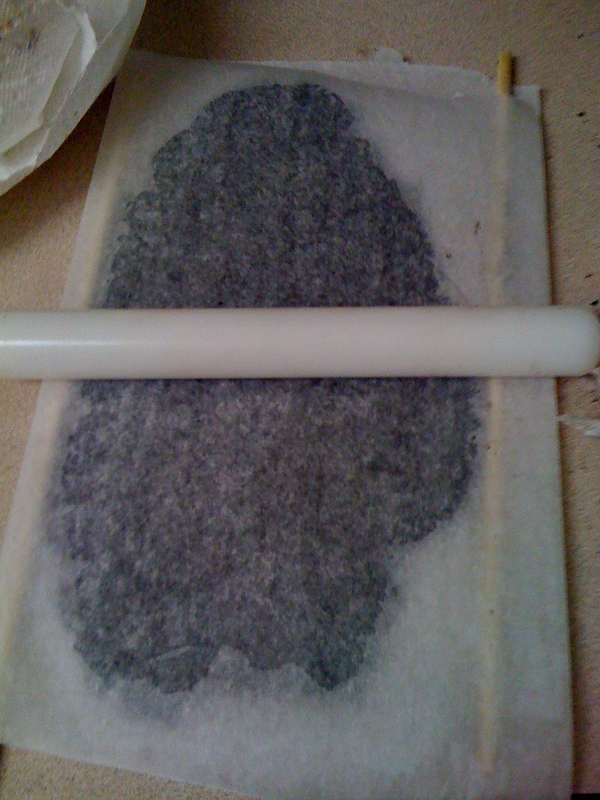 Flip and peel off other parchment sheet. Cut into shapes and place cookies 1 inch apart on parchment lined cookie sheets. Bake 10 minutes until cookie is stiff t the touch. Cool. AIO recommends waiting 10 minutes before moving the cookies from the pan to the cooling rack. I have two restaurant-type baking pans so I switched back and forth with one in the oven and one cooling rather than using cooling racks. The next day, I added a thin layer of store-bought frosting and sandwiched the cookies. I was too tired to attempt making my own filling. 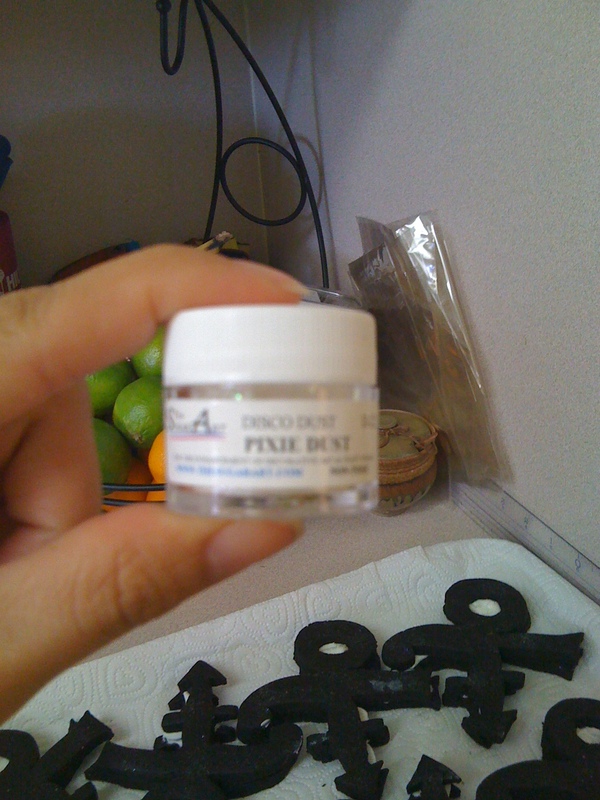 Then, I used a clean paint brush to lightly dust the cookies with disco dust in pixie (I love disco dust!!) to add a glittery look to the cookies. 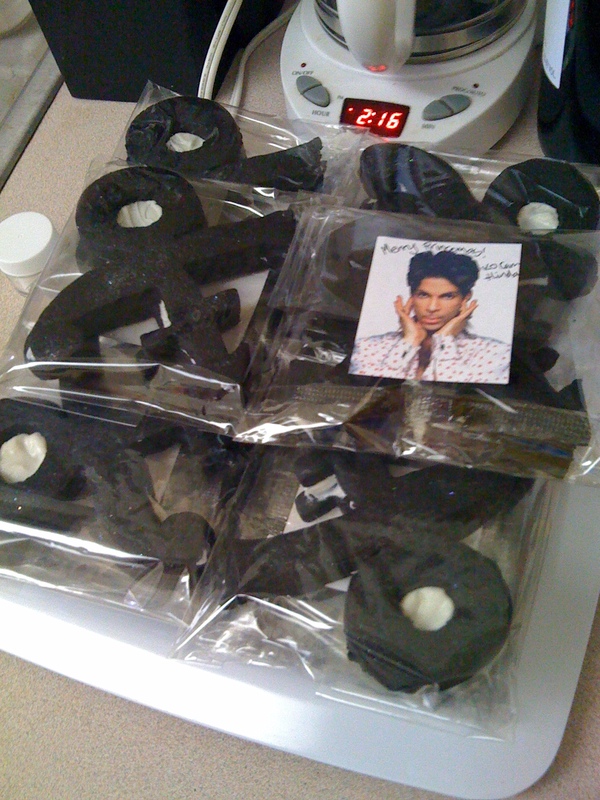 I placed them in a plastic bag and printed out Prince images for the back seal. After discarding the broken cookies, I had 22 sandwich Prince cookies from six hours of work. Eek! People were quite impressed although I’m not sure I would do it again. 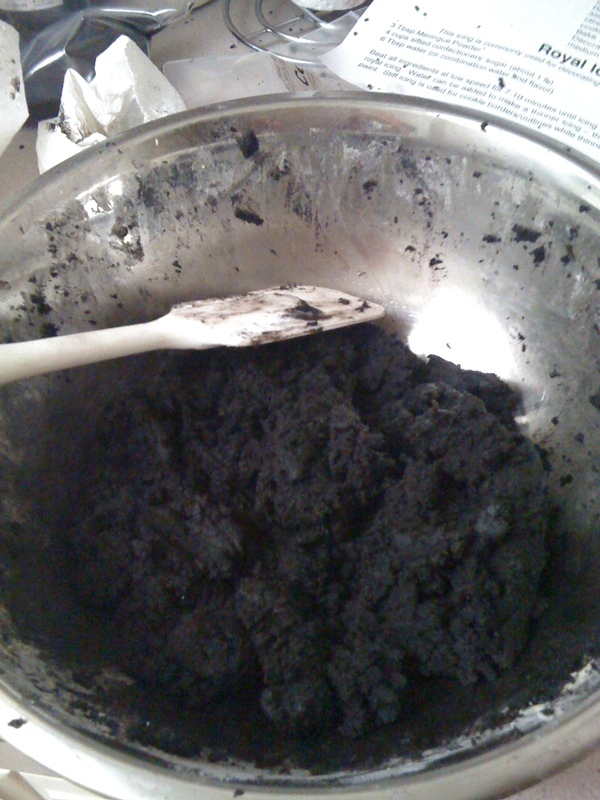 I also realized I forgot to add baking powder and baking soda, but they tasted just like fancier Oreo cookies. The process would have been a lot easier if I had the proper tools (e.g. larger rolling pin, real mixing bowls) and more space to work with. C’est la vie. 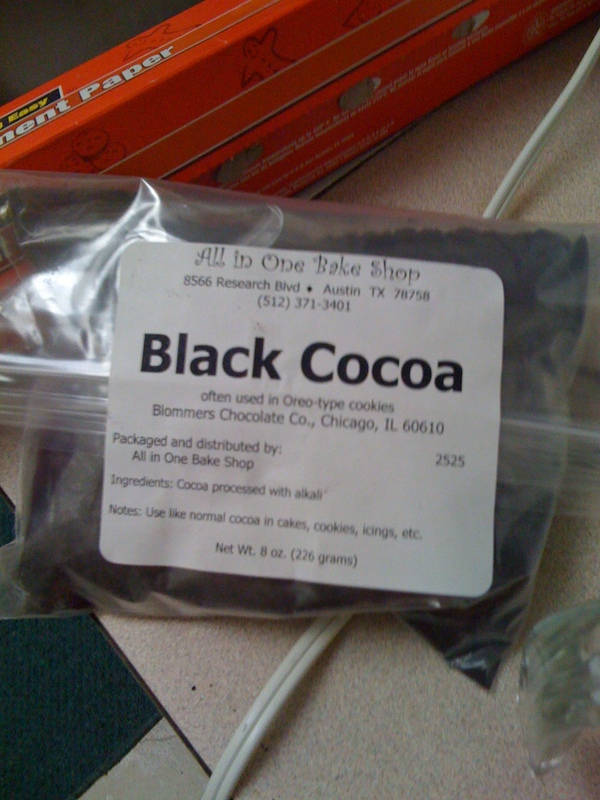 This entry was posted in Food and tagged Black cocoa, Cookies, Sandwich cookies. Bookmark the permalink.